From the house of CGH Earth, we offer Experiential Holidays, Well-being, Ayurveda Hospitals and Naturopathy Healthcare. Eco-living close to the wild. Embracing Fort Kochi's Colonial history. Live like the Kochi Rajah. Backwater life in traditional houseboats. Franco-Tamil culture at its best. 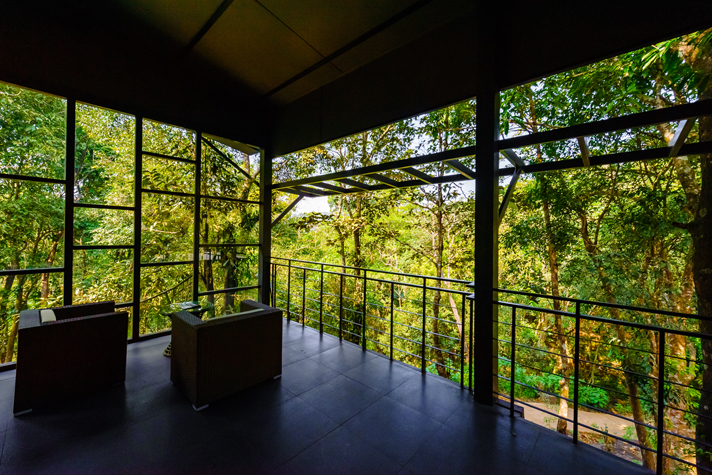 Situated in the heart of the rainforest, with rooms peeking out of the treetops and an infinity pool tipping over into foliage, Wayanad Wild brings you closer to nature. While we can provide you with information on Jeep safaris, the wilderness offers the most exciting experiences when explored on foot. You can identify interesting plants and small animals on guided tours with a naturalist and if bird watching is your thing, the canopy offers up rare migratory birds for spotting. A Wayanad Wild holiday is family-friendly. Your children can discover their love for the great outdoors through various hands-on activities. You can engage in light treks into the woods, hiking to neighbouring hillocks, cycling, and an engaging tour of the neighbouring tea factory. Zip lining and bamboo rafting in the river can be arranged outside the resort on request. The recreation centre with indoor games ensures that your children are well entertained even in the evening hours while views of star-filled skies await them at night. For a uniquely immersive experience into nature, this all-new destination from CGH Earth offers an ideal luxury vacation for the entire family. Make new friendsCome mealtime, and you will be greeted by the Giant Malabar Squirrel – the two-toned friendly giant who rarely leaves trees. Meal with a viewOur cuisine prepared with fresh, local produce and served with a side of a breathtaking view of the forest. The heart of the woodsWayanad Wild is located in the rainforests of Lakkidi, amidst the Western Ghats of North Kerala. Plunge into wildernessEven when you are in the pool, you’ll be immersed into the experience with a view of the forest and the sounds of the wild surrounding you. A walk amidst the wildExperience the thrill of a walk amidst the wilderness as the forest surrounds you. An adventure awaits Take a guided tour with our naturalist and walk amongst the wilderness. Or hop on to a jeep for a tea-plantation tour. Welcome to the wildGet up close with the wilderness amidst lush forests, and gurgling streams during the rains. Sign Up to receive exclusive offers and news from CGH Earth.